Ireland is known for its rich heritage of mythological tales and ancient symbols. In Irish mythology, tales are usually put into four periods. The first one is called the Mythological Cycle that mainly comprises pre-Christian stories of the god-like early settlers of Ireland, the Tuatha Dé Danann. The second, the Ulster Cycle, focuses on heroic stories of warriors from parts of Ulster and Leinster, with one of the most prominent heroes, Cú Chulainn. Tales of the Fenian Cycle are mainly concerned with the band of warriors called the Fianna and the myths of hero Fionn MacCumhaill. The last one is called the Historical Cycle or Cycle of the Kings. This collection centers around legendary Irish kings and traces back their family stories mixing history with mythology. 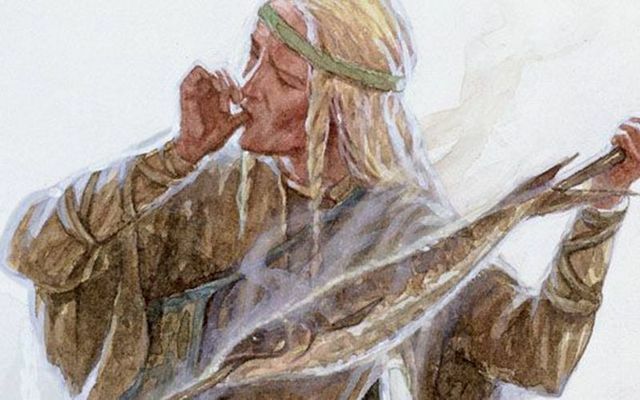 Finn Mac Cumhaill is one of the most well-known heroes of Irish mythology. He was a great warrior and the leader of the Fianna, a group of men who were in charge of protecting the king of Ireland. 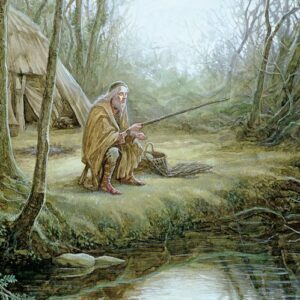 The tale of Finn Mac Cumhaill and the Salmon of Knowledge, however, starts long before the hero’s adventures with the Fianna. It was his father, Cumhal, who led the group of warriors before him. Cumhal’s fate, however, would take a dramatic turn when he fell in love with Muirne, daughter of Tadg. Her father, though, did not approve of the bond. Ignoring Tadg’s will, the two lovers got married secretly. Enraged by this betrayal, Tadg, joined forces with the Morna Clan and declared war on Cumhal and his Clan Bascna. During the battle, Goll mac Morna killed Cumhal and for that was rewarded with the leadership of the Fianna. After the death of her beloved husband, the pregnant Muirne was refused by her father and send away. Shortly after, she gave birth to a boy who she named Demne. But she knew, as he was the son of Cumhal, Demne wasn’t safe from his father’s enemies. So, she decided to give him away, to be raised in a hidden place deep inside the forest by two women. These skilled women took care of the boy and taught him everything they knew. Thus, over the years he grew up to become a great hunter and fighter and was nicknamed Finn. In the meantime, word spread amongst the people of a young warrior hunting in the woods and so Finn’s real identity was in danger of being exposed. Knowing that, his caretakers send him away to find refuge outside the forest. Sick of hiding and running away, Finn decided to take back what was rightfully his – the leadership of the Fianna. But in order to do so, he must not only be a great warrior but also an exceptionally wise man. To achieve this, Finn sought out Finegas, who was known to be the wisest man in all of Ireland. Finegas lived a rural life close by the River Boyne spending his days on the water fishing. He has done so for many years in the hopes of finding a very special, red-speckled salmon – the Salmon of Knowledge – who possessed all the secrets of the world. Tasting from this fish, it is said, would turn the eater into the wisest man alive. Following his teacher, Finn joined in the hunt for the fish. Then suddenly, one day, the old Finegas got lucky and caught the salmon. Exhausted from the day’s work, Finegas told Finn to prepare the fish for him to eat but also urged him to, under no circumstance, to taste it. For he knew, it is only the first man who tries from the Salmon of Knowledge who will acquire its power leaving nothing behind for the second one. Finn did as he was told and cooked the fish for Finegas. But while he was doing so, he burned his thumb on the hot skin of the Salmon. To ease the pain, he immediately raised his finger to his mouth sucking on it. When he was finished preparing the fish he brought it to his master. The wise Finegas recognized a change in the eyes of his student immediately. And when Finn explained that he had not eaten from it but only licked his finger, Finegas knew that he had absorbed the fish’s power making him the wisest man in Ireland.